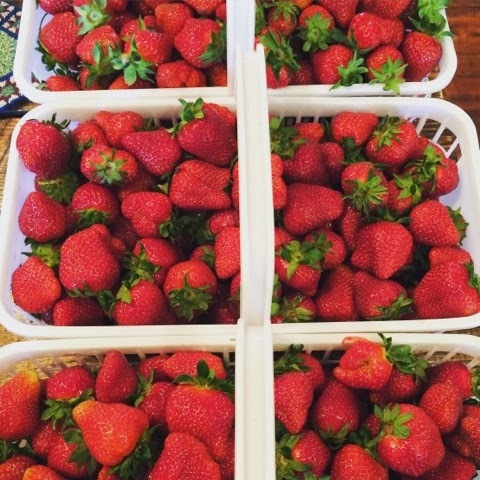 It's strawberry time again here in the southeast and that is one of my most favorite times! These red, juicy, jewels are a treat that just can't be beat! My kids have really been eating them up, but they also have been asking for their favorite jam too. 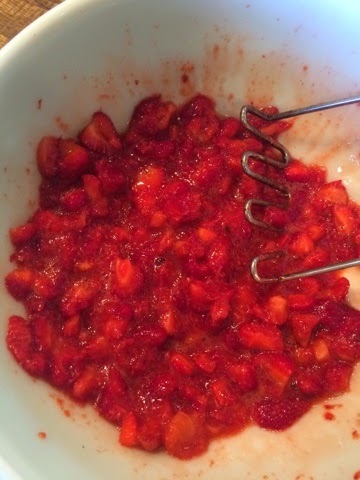 Strawberry jam! It's the most requested when I make it up each year and always the first that is emptied off the canning pantry shelves. I know you can find strawberries at almost any time of year now, but please be careful... Strawberries are highly sprayed in commercial farms. I know we have to do the best we can and we can't always afford organic... but if you can, find someone that you know how they grow their food, or for that matter, grow it yourself if you can! Even if you can't grow it all, and most of us can't, grow some! It gives such satisfaction seeing a meal on your table that comes from your garden or homestead. What a blessing! 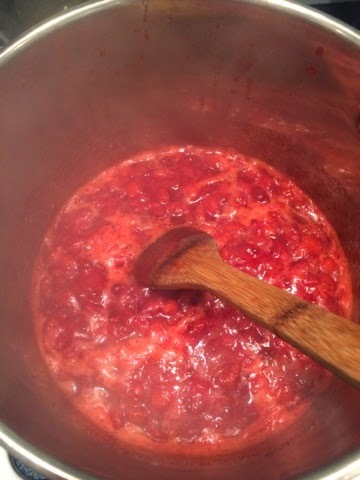 But this one is strawberry jam with Pomona pectin. 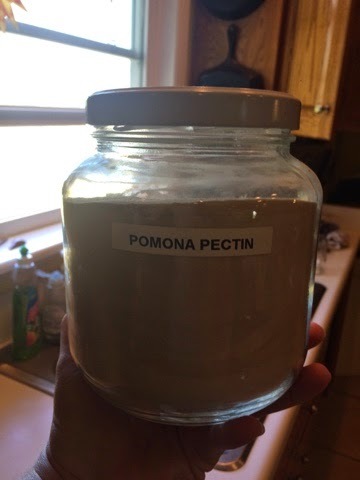 By using Pomona pectin, you can substantially lower the amount of sugar you use! 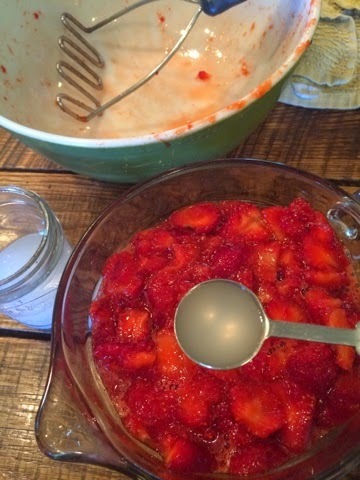 Because I know we have all been there when pulling out everything to make jam, we see the instructions telling us to use massive amounts of sugar. It's gut-wrenching to think we have to use that much. I've got your solution and I'm telling you, it's really good jam! No joke! 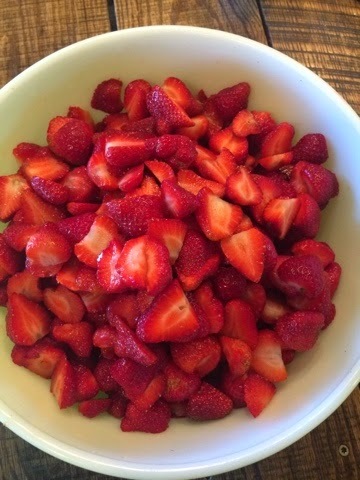 Wash your strawberries and cut them up into slices. For one batch of this jam, you need 4 cups of mashed berries. 4 cups of mashed berries are about 8 cups of sliced berries. I just use a potato masher. I don't want them pureed, I like chunks. With Pomona, you have an extra simple step... You make calcium water. All you do is take a 1/2 cup cold water and add 1/2 tsp calcium to the water (It comes in your pomona pack) and shake. Store in a small jar, label it, and keep it in the fridge... you will have more for the next time you want to jam. 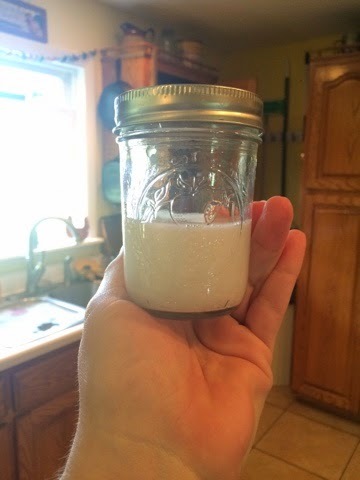 For our jam today, all you need is 2 tsp of calcium water. Add this to your mashed berries. This is an important step, so don't forget it. 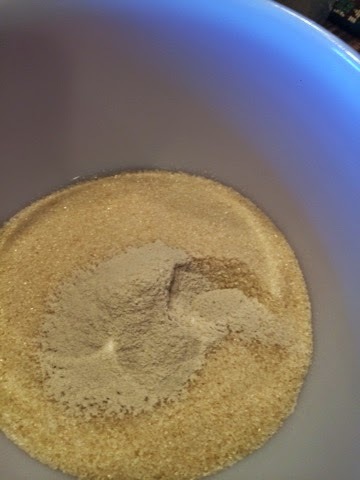 The calcium water helps to activate your pectin powder. 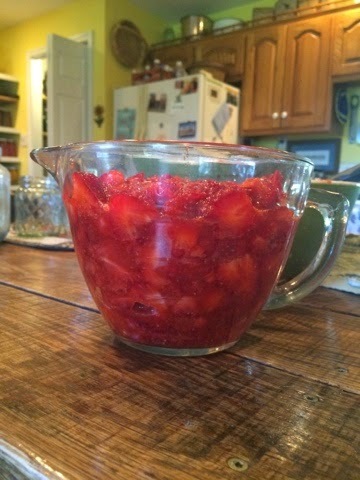 Take your measured 4 cups of mashed berries and your 2 tsp of calcium water and add it to your stockpot. 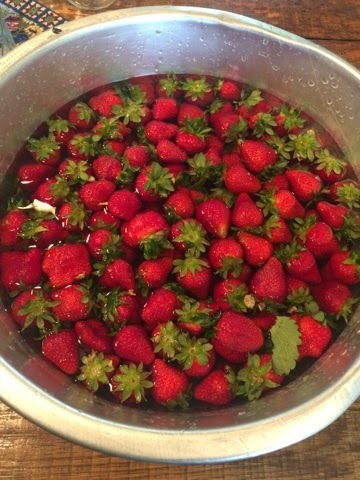 Begin to let your berries cook down slightly until they come to a boil. In the meantime get out your pectin. I buy mine from Azure Standard. I buy it in bulk because pretty much that is ALL I use. I love it! If you have some likeminded friends who love natural food and buy in bulk, see about getting an Azure drop in your hometown! It's a great place to order from. 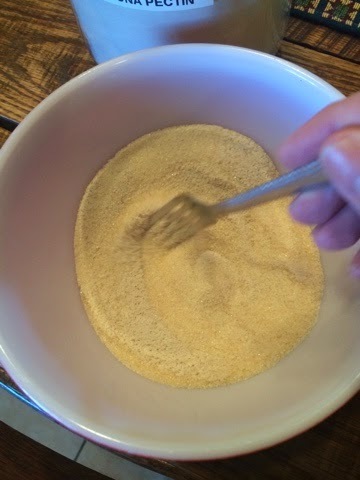 You are going to need 1 cup of sugar, I'm using evaporated cane juice crystals. 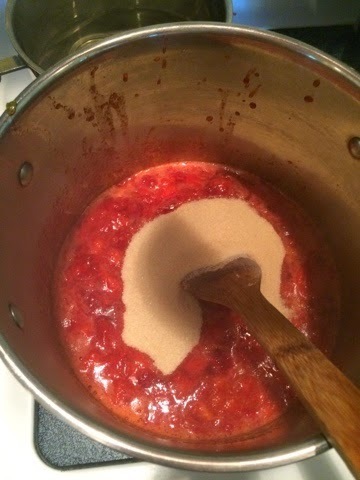 And to that sugar, you need 2 tsp of pectin. 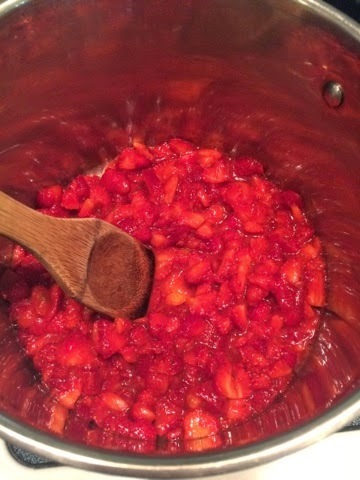 Once your berries are beginning to boil, drop in your sugar/pectin mixture. Stir till combined and then bring back up to a rolling boil. Boil the mixture for 1 minute! 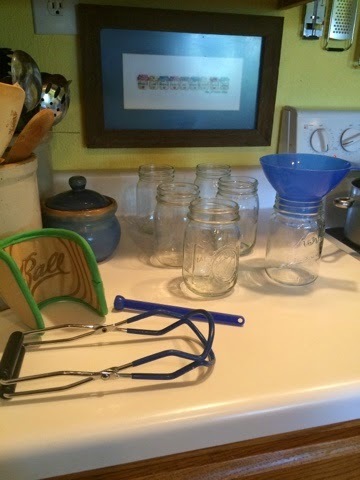 Have your clean jars ready and your lids and bands in simmering water. 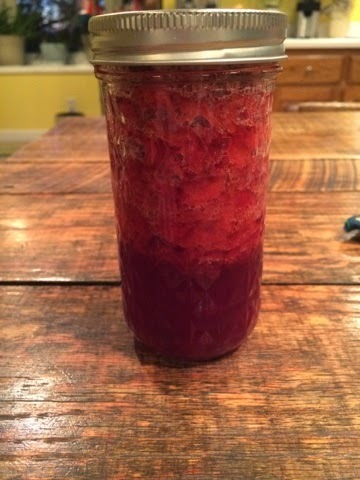 Once you have boiled your jam for 1 minute, pour up into jars. One batch made about 2.5 pints of jam or 5 half-pints. Clean your rims, add lids and bands and put in your hot water bath canner for 10 minutes. Once finished, transfer to a safe place to allow your jars to cool COMPLETELY. Approx 24 hours. This will help your jam to set up. You won't regret the time and effort for this delicious treat.